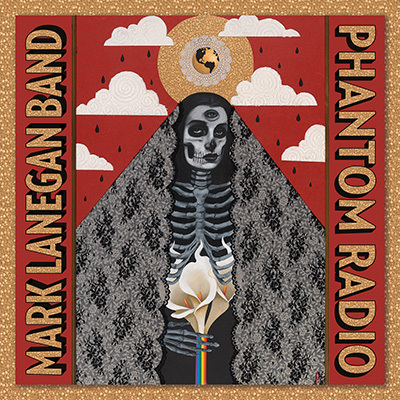 Album Review: Mark Lanegan Band, "Phantom Radio"
Good sounds all around from Screaming Trees mainman (and erstwhile Queen Of The Stone Age), Mark Lanegan and his band (including the incredible Alain Johannes on guitar and production duties – if you don’t know, do your homework). Ten somewhat dark but yet wonderfully accessible and ear pleasing songs – the man can write a melody like nobody’s business. Phantom Radio is the 9th album Lanegan has released away from The Screaming Trees and a fine collection it is. Starting with the opening track, “Harvest Home”, which rolls along with a taut drum pattern and recurring guitar riff which swirls alongside Lanegan’s growl perfectly – one of the best album openers I’ve heard for a while. “Judgement Time” has a grim, almost religious feel about it with its table-top organ sound and the very subdued delivery in Lanegan’s voice. “Floor Of The Ocean” has a very ’80’s sound to it with the synth and electronic drum pattern – sounding like a depressed O.M.D. (and throwing in a low-mixed guitar riff); “The Killing Season” is a bright-sounding but no less morbid-themed track (“The killing season it’s beginning/I feel your hands around my throat…”) and “Seventh Day” has a sinister groove – with what sounds like an orchestral arrangement behind the electronic accompaniment. This is a well-executed album – cohesive, structured, thematic – and yet completely tuneful. It almost seems contradictory; for the themes to be so dark and, at times, creepy but the melodies keep this from being dirgy and dour. Phantom Radio is another album to add to your collection.